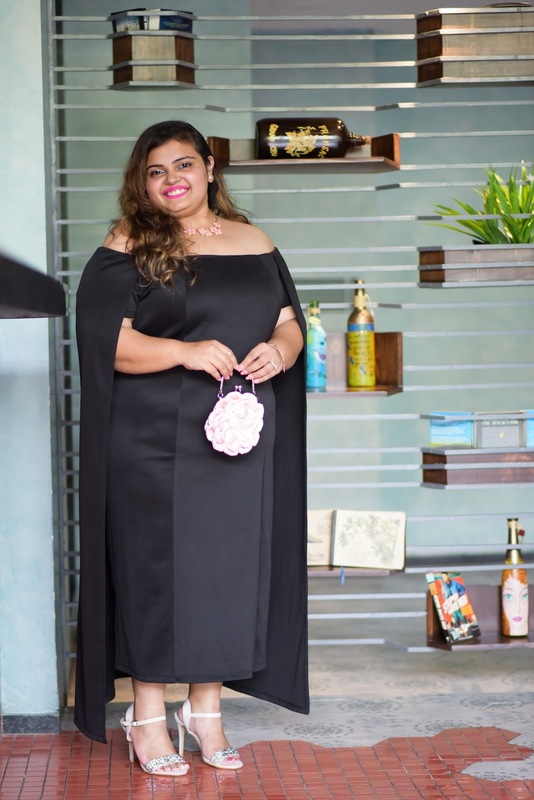 A wardrobe staple, I own around six to seven black dresses of different styles and lengths; but, every time it came to picking out an outfit for a special event in the recent past, something about my collection seemed amiss. They say every woman needs an LBD; I say every woman needs two - a Little Black Dress as well as a Long Black Dress. ❤ Little ones I own multiple. The perfect long one I found on the curvy section of Afamado! 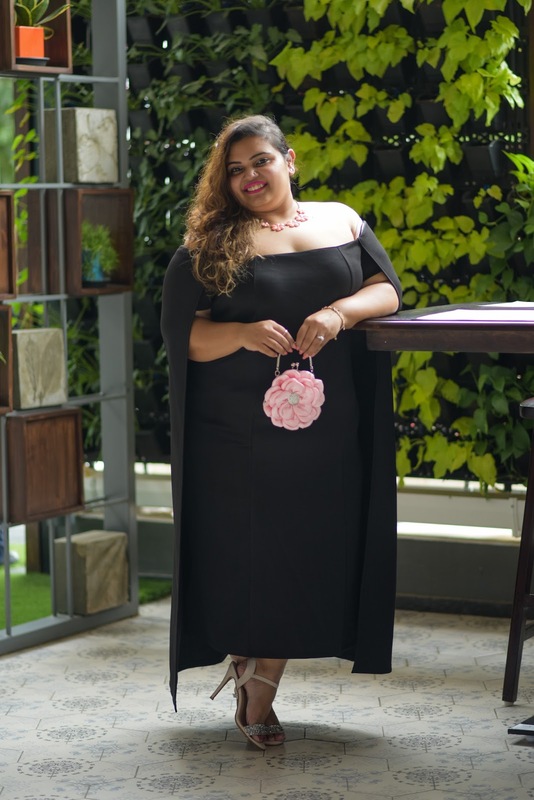 A bodycon fit, this Off the Shoulder Cape Dress made for an ideal cocktail outfit pick. Right from the length to the fabric and the fit, all the elements lend a sophisticated feel to the overall look. A beautiful blend of two of my favourite recent trends, cape sleeves and off-shoulder neckline, this elegant creation was love at first sight...The word Afamado in Spanish means celebrity and that's exactly what the brand aims to make every buyer feel like. 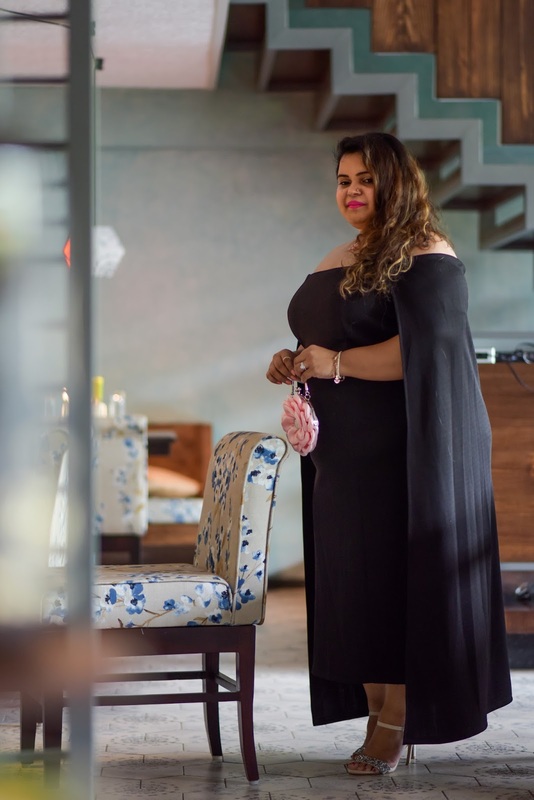 Irrespective of size, an outfit is special when a woman wearing it feels every bit like the diva she truly is. Well, thanks to this exceptional brand, having your very own red carpet moment and dressing like the world is your runway got a whole lot real! Coming to my look, what adds to the magic of black is the versatility the colour offers in terms of styling. 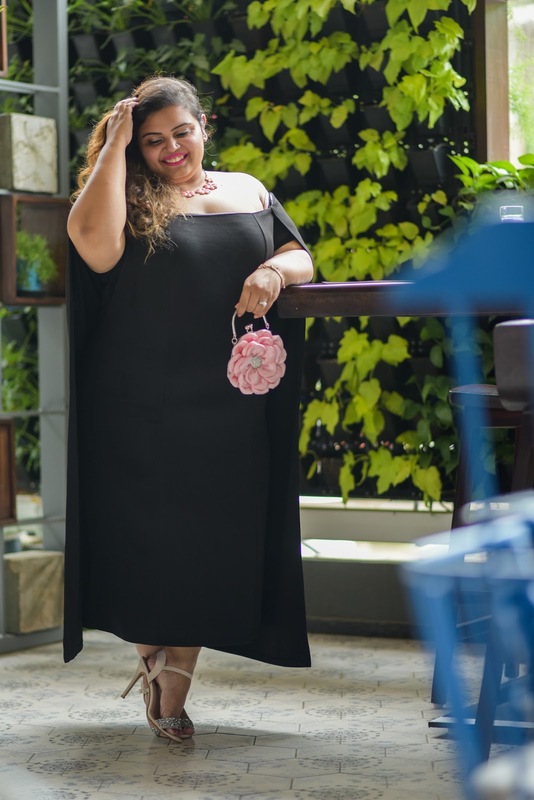 Adding colourful accessories to an LBD not only makes the colour pop but also helps pull the entire look of the dress together. I chose pink. A tiny blush pink clutch, a floral neckpiece and stilettos with shimmer detailing (from Carlton London) were the perfect accompaniments. Keeping the makeup very minimal I went for bold lips with Huda Beauty (shade - Video Star) and c'est tout! 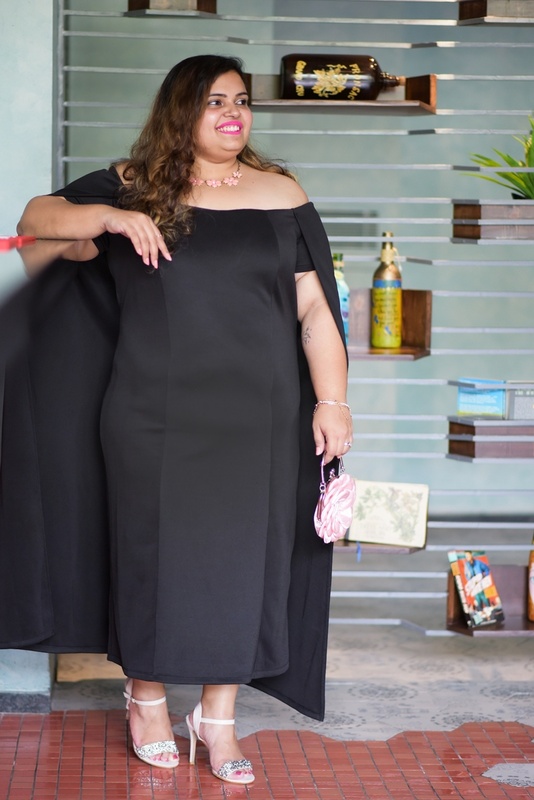 This was my take on elegant dressing for a cocktail party or a black tie event. Hope you enjoyed reading through the post. Do scroll below for more pictures of the look. P.S. Women who wear black lead colourful lives...Do you agree? Hi there! Great dresses here, thanks for the article. It will be very interesting for me to read. I want to ask you for some help. 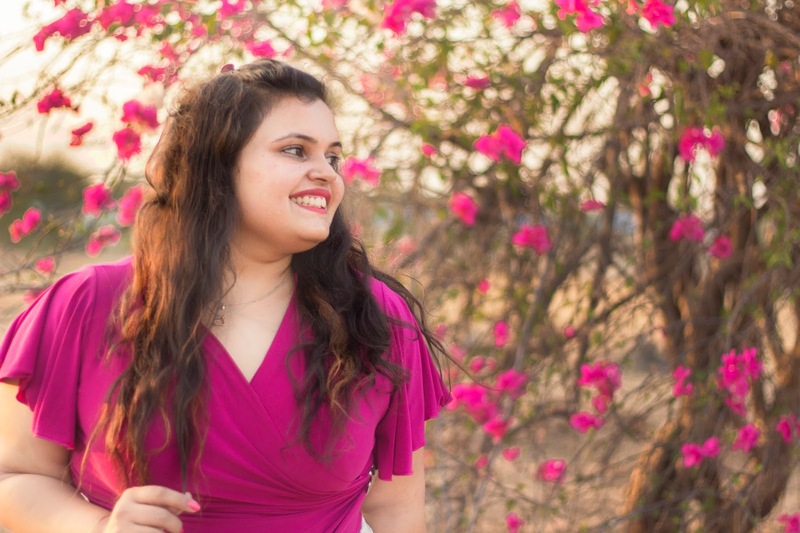 I will have my wedding at Pune - https://pune.wedding.net/venues/ and I would like my dress and accessories to match the place of the ceremony and its mood overall. Can it be done? Maybe you can recommend me some good specialists on it? It would be perfect!